Towering to around 61 metres (200 feet) above the ancient river valley and set in the landscape of the Big Muddy Badlands, Castle Butte is a relic from the last ice age. As a prominent feature in the otherwise flat prairie lands of Saskatchewan, Castle Butte was once used as a landmark for Northwest Mounted Police patrols, Indians, early settlers and outlaws travelling through the area. The area also provided a refuge and hiding place for outlaws on the run from the authorities. 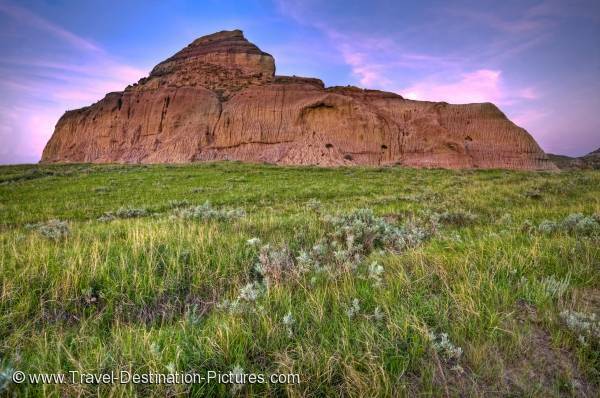 Photo of sunset over Castle Butte, a feature of the Big Muddy Badlands in Saskatchewan, Canada.